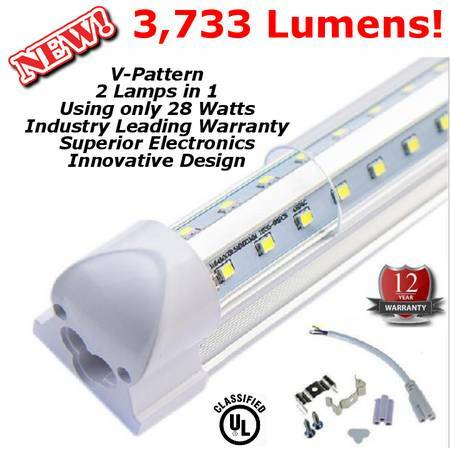 – These lights are very bright, using a fraction of the wattage that low end LED products use. – They work great in cold conditions “Instant On”, like coolers, meat prep, garages, pole barns, etc. – The New innovative design includes Stainless Steel Mounting Hardware, looks and performs as a high end, commercial/industrial LED product should in workshops, utility sheds, utility and laundry rooms, etc. 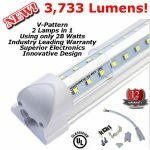 – Our V-Profile Series lights provide excellent lumen projection, using few watts, and are designed to replace inefficient High Output fluorescent/magnetic ballast systems using 2 HO lamps. – Easy to install, offering end to end, continuous run installation, up to 6 in the run.